We’re back with a slew of strange tales from Destiny and how it spills over the walls of our consoles. This week we look at how feet are the new tool of choice against Crota’s minions, how Bungie achieved it’s scandalously high player retention rates, and how our own sick loot cave cravings ended up killing the practice for good. Scouring the Internet is a dark, scary business, which is why we’ve gathered the strange and fascinating stories here in one place. A few of these stories delve into information released at GDC this year, so be sure to check out those presentations if you’d like to learn more. Some of these GDC slides are meant to be springboards for discussion rather than the complete discussion – which means a lot of them are just images out of context. So without further ado, let’s dive into this week’s Stranger than Fiction. Have you ever prayed to the great Oversoul that someone in your party would be Swordbearer against Crota so you wouldn’t have to mess with it? Well the next time someone picks up that sword, it just might be Derek playing with his feet. A recent article in Inquisitor spotlighted Derek, a Destiny player with Cerebral Palsy who beat Crota with just his feet and index fingers. And Derek’s friend, Brian McDonough, recorded the whole thing and uploaded it to YouTube for our viewing pleasure. That isn’t even the best part. Derek soloed the first part of the Crota raid and only got Brian in on the action to finish Deathsinger and the big man himself. It’s not the first time someone beat the raid without full mobility, either. Destiny players like theKAPGUN have crushed Crota using just one hand. In these discussions it becomes all to easy to think of it strictly in terms of a disability overcome, but isn’t it sometimes nice to just remember that a handicap is just a barrier to doing things the way everyone else does them? If we’ve got to change up the rules so we can enjoy a game like Destiny, why not change them? It’s a beautiful thing, and one I’m glad to see in the news. Which reminds me, maybe it’s time I give Swordbearer another crack. I feel like Crota’s kinda begging for another slash or two. 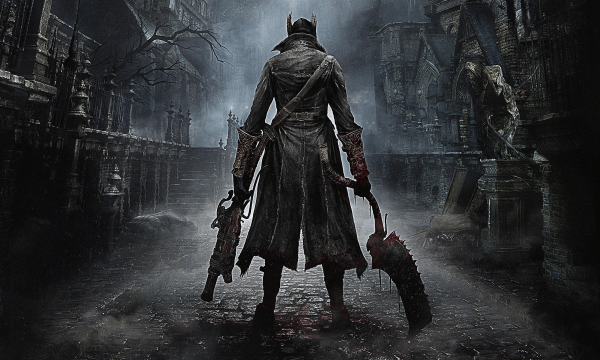 This week I’ve been equally distracted by another game: Bloodborne. Turns out, there might be a good reason for that. According to the Financial Post, Destiny and Bloodborne are secret twins of a sort, and one of the reasons why is rather unusual. “Okay!” you may be shouting. But that’s probably not the four-letter word that will come flying from your mouth after you’ve died for the fortieth time. But the most interesting element they have in common? Repetition. Repetition. Repetition. That’s right – sometimes that lack of content is intentional. In both, back tracking and strategy-testing is the name of the game. Who hasn’t poured over YouTube videos or the Crucibible wondering all the time how to tackle that map or strike you’ve played dozens of times in a more efficient way? And that’s what’s most interesting about the similarities. They both are so skill oriented that often gaining an edge is simply a matter of small, incremental improvements. Have you spent hours perfecting your Destiny game in the Crucible or have a particular Strike spot to take down Valus Ta’aurc? Tell us about it in the comments, as I’m sure I could use a few pointers at this point! But before moving on, let me just point out one key difference between the two: at least in Destiny I can choose who I get paired up with in co-op, and there’s a much better chance that they won’t try and kill me – I take solace in that. In Bloodborne, you can only take solace in weeping and rocking back and forth in the fetal position. A report came out in Gamesradar this past week that confirmed what we’ve all known too well: Destiny is crazy addictive, and by design. Three years of design to be exact. That’s because in the earliest stages of development, Bungie was holding focus groups to discover how players responded to rewards the game was dishing out. This is hardly unusual. Game designers do what is referred to as user research surveys all the time. It’s a necessary part of marketing: understanding the audience you’re trying to reach, and most of the big-dog developers invest huge chunks of money into the process. They divide players into subgroups, known as market segments, and find which groups are likely to stay with the game the longest. Those are the people they target. That developers use the process isn’t at all surprising, really. But what is surprising is just how well it’s working for Bungie. The stats quoted are staggering. 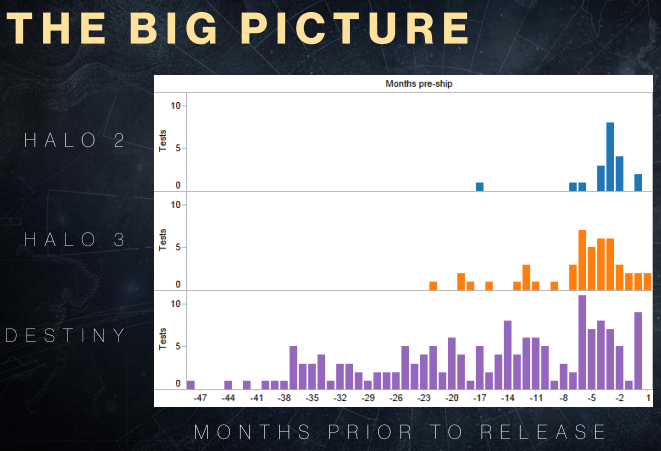 On average, players spend 77 hours playing Destiny. That means for every player who spends less than 77 hours, someone else is spending an equally proportional time over that amount. And by any game’s standards, an average playtime from all its users of 77 hours is just astronomical. Not to mention the 3-hour average daily playtime. For an MMO-light experience like Destiny, those numbers aren’t anything to scoff at. The question becomes, what are we to think about game developers targeting our behaviors? Is it all in the name of a better user experience, or something more sinister? While we’re on the topic of addiction, a community member recently emailed us about a major life change he realized had to be made due to his overuse of Destiny and other games – namely cutting ties with all games to focus on his life and responsibilities. If you find playing Destiny (or any game) encroaching on your life, often the best solution is to put it down for awhile. They say that the only way to kill a pleasure is to replace it with a greater pleasure, so find podcasts that you enjoy and do chores to them, or visit friends and have board game nights (an alternative that allows everyone to socialize in the same space). We certainly don’t want to make light of these things, and if you feel you have a problem, remember that moderation is key. Personally, ironing shirts to podcasts really does it for me. Ever wonder why exactly loot caves were killed off? Bungie’s answer is pretty surprising, actually. They wanted to save us from ourselves. Turns out, farming loot from those cavernous wastelands was a wasteland in more ways than one. According to this Kotaku piece, loot caves were a colossal waste of time. And we’re talking a statistically proven waste of time. Bungie’s John Hopson said that players shooting into a loot cave would actually get “less loot per hour than you would just playing the game.” Worse loot, too, because the enemies in these caves were all lower level. And yet people continued to waste hours on end in them (and while I didn’t spend hours, I spent enough time to feel my shame). And, to add insult to injury, the reason Bungie eventually nerfed the practice is due less to the amount of time people wasted and more from the sheer amount of cheating complaints they received. Yep, apparently more players were reported for cheating during the peak of loot-caving than at any other point. Which kind of makes sense. It’s a real rage inducer seeing someone camping with a shotgun on a Crucible map, but imagine how much worse it is to see people constantly parked outside every loot cave just shooting a barrage of bullets into those dark mouths. But in all seriousness, despite the report on Bungie’s addiction-adjacent studies, they do at least make changes that benefit some of our time as players. Not all of it, but they’re a business at the end of the day. Makes me wonder what other things we’re probably wasting our time on when just playing the game naturally would be of more benefit. Not to mention more enjoyable. Before leaving you with these news bits from the week, we wanted to share a video that shares many of the suggestions made in our House of Wolves: Do or Die article and your ideas for the future of Destiny and presents them in a comical way. Micah Bell and friends ponder “What If” Destiny had the things we only dreamed of in this chuckle-inducing YouTube video (also featured in our spotlight). And that’s all for this round of Stranger than Fiction. Remember, if you’ve heard any other weird news in the world of Destiny, sound off in the comments or shoot us a message on Twitter! We always look forward to hearing how the games we love affect the lives we lead. No it’s time to slice Crota a few times. Wish me luck.